These 5 pink Manhattan relish inserts are hard to find and in excellent condition! Beautiful color! 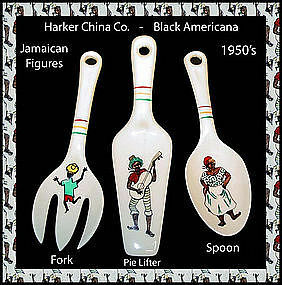 Black Americana with a Jamaican theme, 3pc salad and dessert china serving set made by The Harker China Co. in the 1950's. Excellent condition with no damage, and no repairs. Hard to find! $150.00 ~ 6 pc set~ Mint! 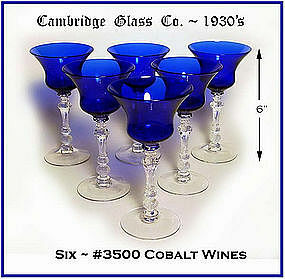 These very tall cobalt, or Royal Blue, #3500 wine goblets are in excellent, unused condition. 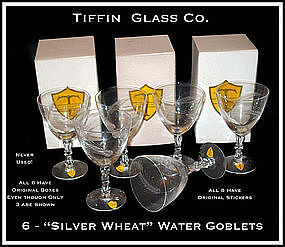 They were made by the Cambridge Glass Co. in the 1930's. Deep, rich color with a very elegant stem. They are some of Cambridge Glass finest work! 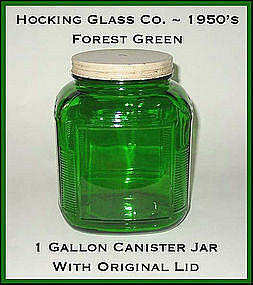 This forest green gallon jar was made by Hocking Glass in the 1950's. It came from the estate auction of a retired employee that worked for Hocking. We bought several of these from that auction. The metal lid is original to this jar, and so is the red handled wire bail. This piece is in excellent condition with no damage and no repairs. Very unusual to see one of these canister jars in this color, with this type of wire handle. 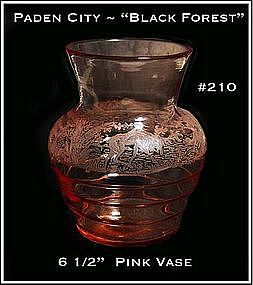 This Black Forest pattern 6 1/2" vase was made by The Paden City Glass Co. in the late 1920's. It is in excellent condition. It is from their #210 Line. 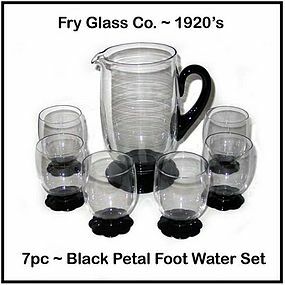 This crystal with black petal foot water set was made by The Fry Glass Co. in the 1920's, and 1930's. It is in excellent condition. The optics that show in the photo are not seen in person. 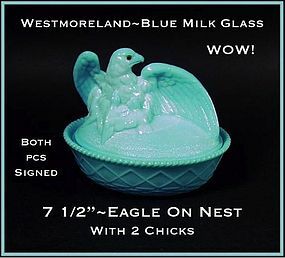 Westmoreland Blue Milk Glass Sitting Eagle On Nest~Wow! A picture doesn't do this beautiful piece any justice. It is much prettier in real life. It is an eagle covered bowl. There are 2 chicks at the base of the eagle. Both pieces are signed and in excellent condition. The eyes are glass and piercing. Stunning! Amethyst ball jug with 6 matching tumblers. 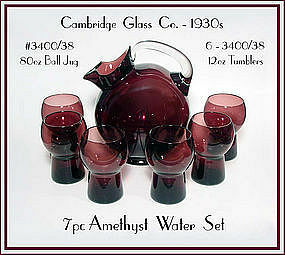 This water set was made by The Cambridge Glass Co., circa: 1930s. Excellent condition with no damage, no wear, no repairs. Thanks for looking! 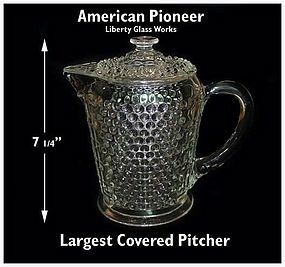 This American Pioneer covered jug was made by Liberty Glass Works in the 1930's. 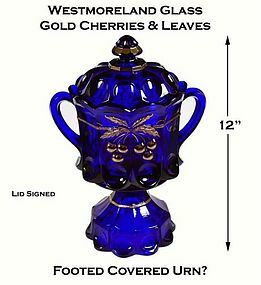 This is the largest of the 2 jugs they made like this, and it is in mint condition. 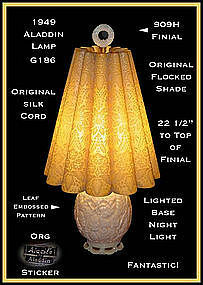 Aladdin Lamp with original flocked shade, original label and a 3 way switch to operate base light, top light, or both. Aladdin part number G 186 made in 1949. Both lamps are excellent. 1 shade has tiny tear on bottom ruffle. Both lamps have their original finial. 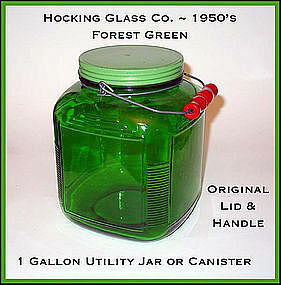 This forest green gallon jar was made by Hocking Glass in the 1950's. It came from the estate auction of a retired employee that worked for Hocking. 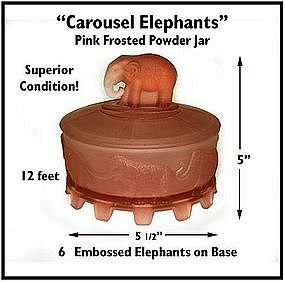 We bought several of these from that auction. The metal lid is original to this jar, but may have been repainted somewhere along the line. This piece is in excellent condition with no damage and no repairs. Very unusual to see one of these canister jars in this color. 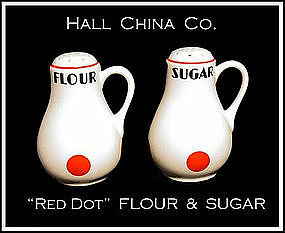 These Hall China, handled, Red Dot on Eggshell White FLOUR and SUGAR shakers are very hard to find, especially in this condition. No damage, no wear and no repairs. Nice addition to your collection! 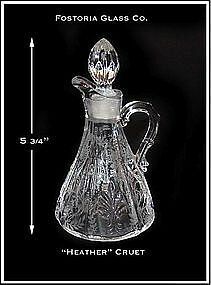 Fostoria Glass Co. made this cruet in the "Heather" pattern. It is in excellent unused condition, and has NO CLOUDINESS! 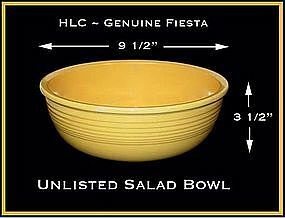 They always called this "The Unlisted Salad Bowl", and they are hard to find in any color. This yellow one is beautiful and has a couple of color misses, but no big deal. Very normal for this time period. No chips, very minor use. It is impressed on the bottom with the old Fiesta logo. 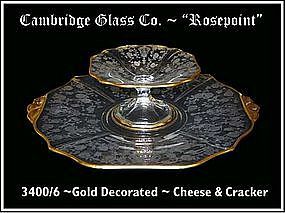 This Rosepoint cheese and cracker set was made by The Cambridge Glass Co. in the 1930's, and is in excellent condition! It has gold decoration on both pieces.